To perform effectively and synchronize the reviewing and planning process of 3 types of forests under the direction of Lao Cai’s Provincial People Committee; on 12th October 2016, PPMU Lao Cai supported Lao Cai Agriculture and Rural Development Department to hold the implementation workshop of reviewing, planning 3 types of forest in 2016 – 2025 period. To perform effectively and synchronize the reviewing and planning process of 3 types of forests under the direction of Lao Cai’s Provincial People Committee; on 12th October 2016, PPMU Lao Cai supported Lao Cai Agriculture and Rural Development Department to hold the implementation workshop of reviewing, planning 3 types of forest in 2016 – 2025 period. 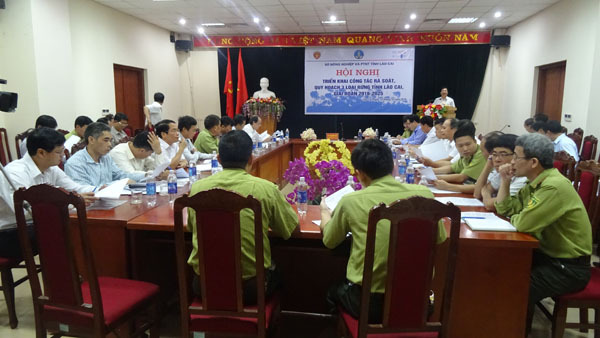 There are delegates from Department of Finance, Planning and Investment Department, Natural resources and Environment Department; Forest ranger sub-department; Hoang Lien National Park; Districts’ people committees, Lao Cai city’s people committee and related stakeholders. In the workshop, the delegates were reported the assessments as well as the challenges, limitations of planning 3 types of forests implementation in Lao Cai province in 2006 – 2015 period. From this thing, the contents, implementation plans, planning of 3 types of forests in 2016 – 2025 will be proposed to meet land use planning in the same period and ensure the forestry land structure about 416.000 ha to 417.800 ha for special purposes, protection requirements as well as using forests and forestry land for production development, social infrastructure development to meet the demand of socio-economic development and maintain the national defense and security in the province. At the end of the workshop, the delegates agreed the the contents, methods and implementation plan for 3 types of forests planning in Lao Cai during 2016 – 2025.